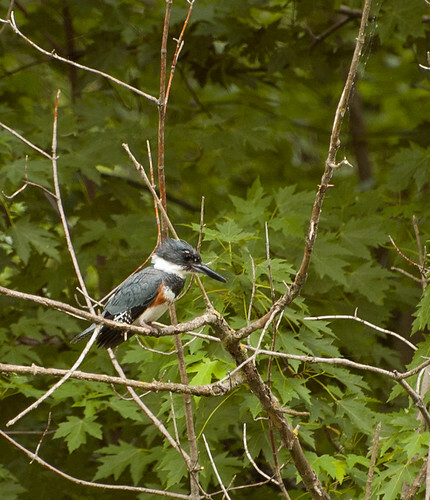 Taking a break from the Roger Tory Peterson Festival this week to gloat over finally capturing a decent photo of a belted kingfisher. This is one of several nemesis birds – ones that I see fairly frequently but ones that prove quite uncooperative when I reach for the camera. 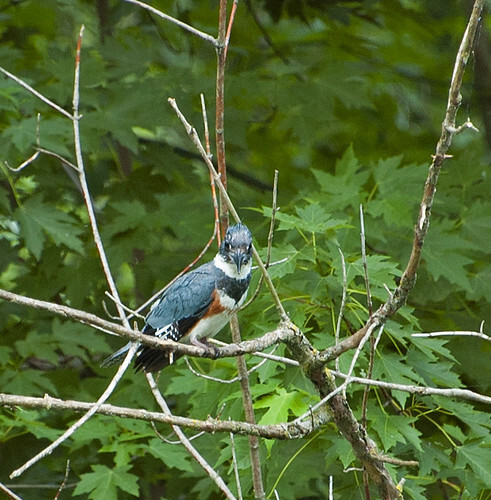 My typical encounter with these birds is that I hear one as it flies away from me up river. I might catch another glimpse further along as it flies further up river or crosses the river rattling away. I’ve managed a few photos but most were quickly deleted. This surprisingly photogenic female was encountered at the Conesus Lake Inlet. I had just pulled into the parking lot when I noticed a bird land on a small tree along the creek. After confirming its identity I ignored it as I gathered my gear, figuring it would be long gone before I got my camera out. But much to my surprise and delight it actually flew to a tree even closer to where I was parked. It looked me over and stayed just long enough for me to fire off a couple quick shots. Despite their photographic challenges, these are interesting birds. They are somewhat stately in appearance but sometimes their head seems too big for their body. They often nest in tunnels built into river banks excavated with their formidable bills (“Squillante nose”). And it is fun to watch them fish by diving face first into the water (but always out of camera range!). My previous ‘best’ photo of kingfishers. This entry was posted on 28 June 2012 by patacoate. 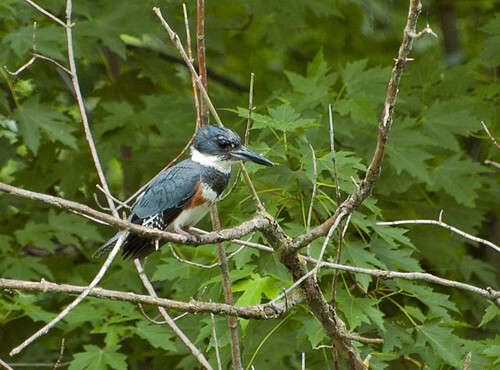 It was filed under iPhone and was tagged with Belted Kingfisher, female belted kingfisher.